I have been so very busy lately that I haven't had time to look at the blogs I normally visit. So this afternoon I stole a few minutes and looked at old Spidatter posts. 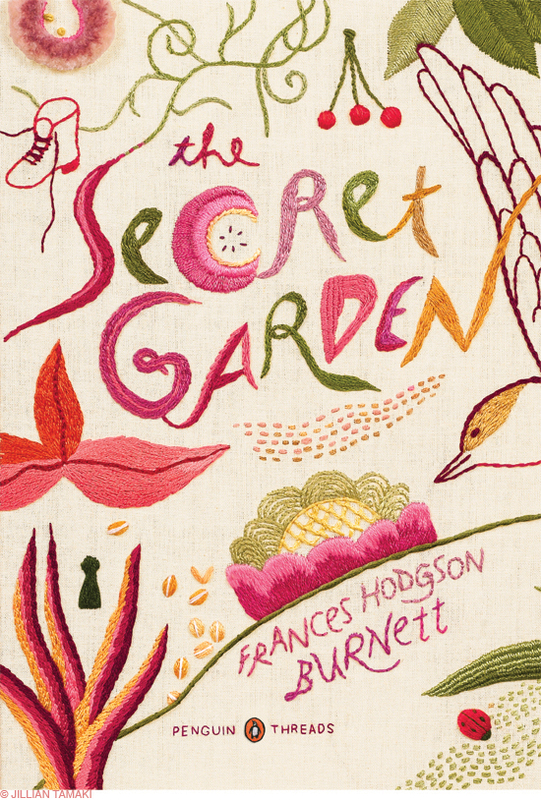 That led me to Jillian Tmaki's embroidered book covers for Penguin. Oh my – they make me want to embroider! So from there I went to Jillian Tmaki's actual blog post about these covers and I got to see more book covers. Now I really want to embroider! Then I went to the top of her blog and today's post is about a quilt. As I scrolled through her posts and read more about her I realized that I have seen her illustrations before and loved them. All of this leads to inspiration. Just looking at her sketches makes me want to pick up my pencil which is good because I need to be working on the designs for our next book. I feel better! As I start scraping popcorns off of mom's ceilings tomorrow I will be thinking about what to draw. In other news – Chuck is a boy. I took him to the vet today. He is about 7 weeks old, 1.5 lbs, definitely male, and they predict he will be a handful. He also has worms and parasites and protozoans – bad stuff that we caught at a good time. We'll be continuing to give him medicine for 9 days. And, for those of you who know we have 2 other cats, they are apparently not in real danger of getting anything from Chuck because they don't go near him or his litter box. So it's a good thing that they are best buddies yet! Next, send Steve to a building center to purchase a full sheet of the foil covered styrofoam insulation they use when building homes. Trim it to fit the closed Morphy bed. Use duct tape to cover it with a good cotton batting or flannel. Hang it temporarily over the top of the bed using large plastic covered metal hooks. Behold! A new design wall!. I also hung extra white cotton flannel from the bottom of it so it reaches the floor. I can easily lay out most of my quilts in progress. When company comes, I fold up and pin the cotton flannel, lift the entire piece of foam and move my design wall to another room in the house. When the company is gone and the sheets are clean, I quickly reclaim my sewing room by rehanging it! He’s an adorable little guy! All that stuff hasn’t slowed him down any, has it?